Seeing Petra during the day is an overwhelming experience for most visitors. By night, the ancient city transforms into what must be one of the most magical places in the world. Thousands of candles guide visitors through the Siq (a canyon) to the main square where the Treasury is located. It’s a truly romantic experience and a perfect place to pop the question (for those planning to do so). 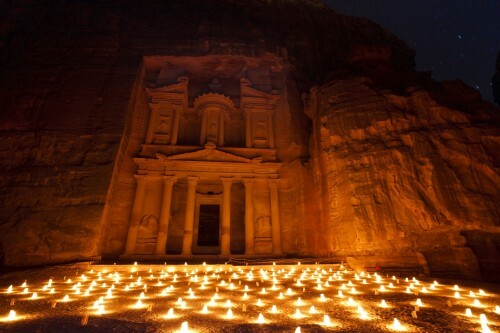 This is a great thing to do in the evenings if you’ve already seen Petra by night. The Petra Kitchen (located along the main road in Wadi Musa, a few hundred yards away from the main entrance to Petra) is a lovely place that promises an educational and fun-filled evening. Visitors don gloves and aprons, and under the supervision of the restaurant’s chefs, learn how to create typical Jordanian dishes. The Siq is a canyon that connects the city of Petra with the outside world. It’s a wondrous experience to walk on thousand-year-old cobblestones and see the curvy rock face in a multitude of colours. Look for traces of ancient dams and water channels used by the Nabateans to control the water supply into the city. As the Siq was the main entrance to the city, the Nabateans carved magnificent statues and arches along the Siq. Little of it can be seen today but look carefully… what may at first look like a hump in the rock face may actually be a carving of a camel. As you make your way around Petra, you’ll see various Bedouin tents that provide visitors a shady respite and refreshments. Strike up a conversation with the Bedouins – many of them are from Petra and speak good English – and ask about stories of their ancestors living in Petra. Chances are, you’ll get to hear a fascinating story about what it was like living in Petra in days bygone. Another interesting person to meet is Marguerite van Geldermalsen. She was a backpacker from New Zealand who visited Petra in the 1970’s. She met and fell in love with Mohammad, a local Bedouin, and she never left. Her heart-warming story about being married to a Bedouin and adjusting to the lifestyle is a great read and I highly recommend it if you’re visiting Petra. While you’re there, look her up. There are numerous trails which lead hikers through the mountains and to breathtaking vantage points such as the High Place of Sacrifice. It’s a great way to discover lesser-known ruins like Little Petra, as well as admire colourful and strange rock formations. This is a desert climate so wear appropriate clothing (a cap and proper hiking shoes are a must) and bring plenty of water and some food. Avoid venturing off the path and make sure you get back to the main gate before dark. Information about guides and trails can be obtained from the Petra office at the main entrance. The Monastery is another of Petra’s highlights. Located in the mountains above Petra, it’s a pretty tough hike to the top. 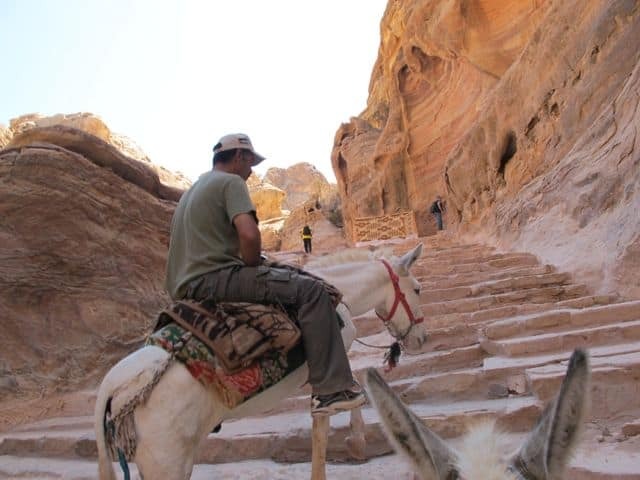 An alternative to hiking to the Monastery is to ride a mule up. It’s fun and quite harrowing at times but you’ll get there in good shape! A one-way ride to the Monastery costs ten dinars (about $15). Petra/Wadi Musa is a great place to shop for traditional Jordanian and Nabatean handicrafts. You can visit various Bedouin tents in Petra (near the Roman ruins) and learn about the culture of the various tribes as well as local community initiatives to improve the livelihoods of the Bedouins. These places have a modest collection of silverware, stone carvings, embroidery and pottery. There is a bigger variety in the Wadi Musa township. The Nabatean Ladies Cooperative of Wadi Musa is an initiative that focuses on the production and sale of silverware and jewellery to wholesalers and tourists, thereby creating jobs for the women in the township. The cooperative operates a modest retail outlet along the main street in Wadi Musa. This is another magical Petra experience that you simply cannot miss. As Petra is located in a valley, you’ll have to travel to the outskirts of Wadi Musa to see the sunset. The best spots to see the sunset are located along the road (no. 35) from Wadi Musa to Taybeh, about a 5-10 minute drive from the centre of Wadi Musa. There’s a small municipal park (where the picture below was taken) that has a great view of Petra – the city is right there at your feet but you’ll only see parts of it if you look very carefully! As the sun sets, watch as the mountains change from a bright orange to gold. 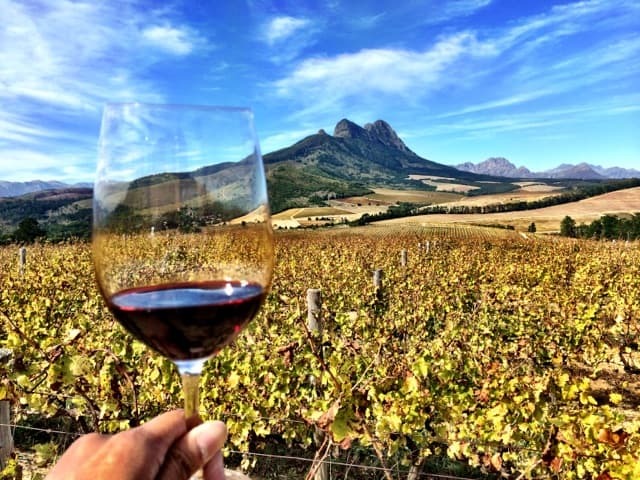 This is one experience you won’t easily forget! You can also opt to enjoy the sunset at one of the hotels along road no. 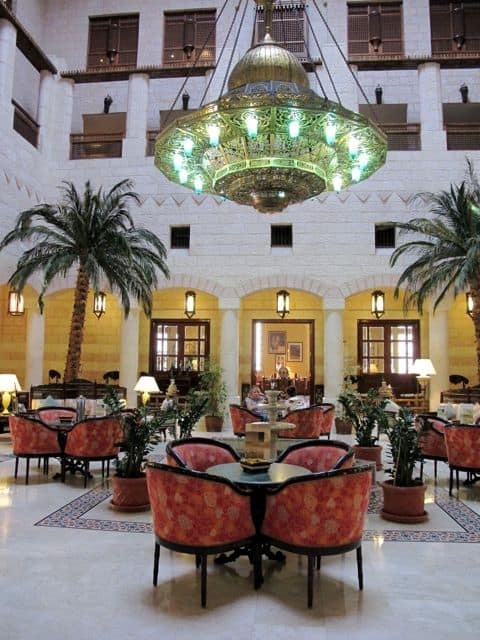 35 such as the Mövenpick Nabatean Castle or the Marriott which boast commanding views of the mountains and the valley. After a day of trekking through Petra, there’s no better way to soothe those aching muscles and rid yourself of the dust and sand than to check into a hammam (or Turkish bath). There are several hammams in Wadi Musa (the township adjacent to Petra) that serve both male and female clientele. A typical hammam session consists of a steam bath, a body scrub and an oil massage. The Mövenpick Resort Petra is an excellent base from which to explore Petra as it’s situated right next to the main entrance. 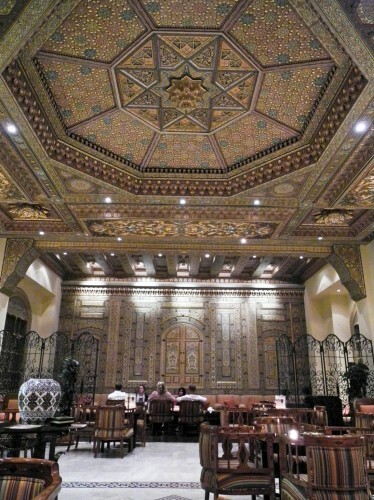 It’s Arabic-style interior is stunning, not to mention inviting. The atrium is beautiful but make your way to the adjacent bar for a drink – the interior of the bar is absolutely gorgeous! Note: a big thank you goes to the Jordan Tourism Board for hosting me in Jordan. Petra is amazing and I’m sure you’ll be in awe of it. Definitely not over-rated. I highly recommend going there in the evening as well – it’s absolutely magical! Have a great trip! Al Yakhor Turkish bath is located in Quiet Street where next to Petra Palace hotel. Just 200m far from main gate of Petra. Freshen up with a centuries-old spa treatment! A scrub in a Turkish bath is not just part of a bathing ritual, it also helps with detox and enhancing our immune system. Indulge in a hammam and get clean on the inside as well as out! The Turkish bath, also known as a hammam, is the Middle Eastern variant of a steam bath. During the Ottoman Empire, Turkish baths served as places of social gathering and ritual bathing. Today people use the hammam as a pampering form of cleansing and relaxation. The Turkish bath is modeled on the Roman system of bathing with a warm room, hot room and cool room. The bather enters the warm room where their body warms up, then enters the hot room, or steam room, which has water basins along the walls and a large heated stone platform in the center. The bather can rest on the stone to increase body temperature and promote sweating, then rinse off at the water basins. One of the main specialties of the Turkish bath is the foam and scrub massage where a masseuse or masseur lathers up the bather with a special cloth sack full of foam and scrubs off dirt and dead skin with a loofah. The bather can then continue to relax in the hot room and enjoy the therapeutic benefits of the steam and heat. Petra at night looks spectacular. There is nothing like strolling down the street admiring the beautiful scenery of this place. I was dreaming of doing a cooking course there, but never had a chance. I will go for it soon though. Great review by the way. Petra is indeed a mesmerizing place. The Treasury & Monastery are two distinctly different structures. The Treasury is the most famous of the two; it was featured in one of the Indiana Jones movies. The monastery is quite a distance away in the mountains. Hope you get to visit Jordan one say soon. WOW, i am mesmerized! I am so loving this post and a great way to explore it is by feeling it through your feet and all your senses. I liked the idea of getting on a mule to go to the monastery that must be awesome. The treasury and monastery perhaps, looked the same? or is it me looking at the same photo all over again. Jordan is indeed a great country. I will be praying hard that I will get there too and perhaps write about it on my travel blog too. Cooking? Great idea. I’m not even certain what’s on the menu in Jordan. 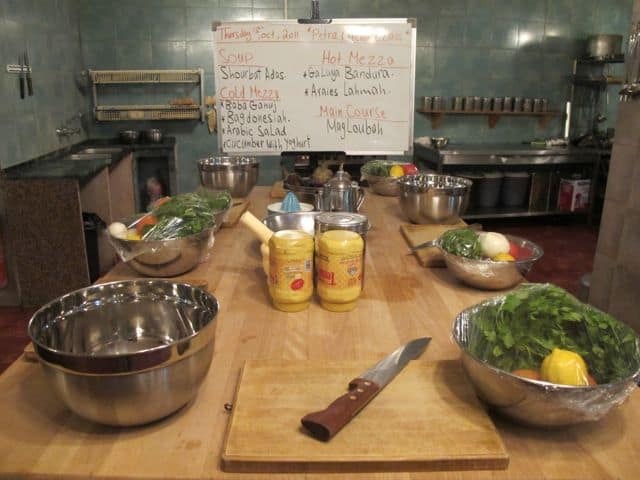 I would love to do a cooking course in Petra! further solidifies my desire to get here! would love to take a cooking class, too!! !